Chicken noodle soup is a staple in our house. We love it and make it all the time. I have made it for friends and neighbors and everyone loves it. 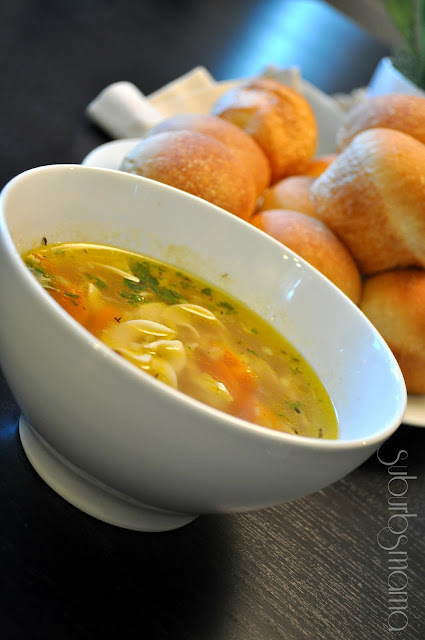 The recipe is easy and you can't beat a pot full of chicken noodle soup. Place a soup pot over medium heat and coat with the oil and 1 TB of butter. Add the onion, garlic, carrots, celery. Cook and stir for about 10 minutes, until the vegetables are softened and slightly browning. Pour in the chicken stock and bring the liquid to a boil. Add the noodles and simmer until tender. Add in the shredded chicken, and continue to simmer for another couple of minutes to heat through; season with salt and pepper, thyme, basil, bay leaf. Sprinkle with chopped parsley before serving. Place the chicken and vegetables in a large stockpot over medium heat. Pour in water (about 16 cups) Toss in the thyme, basil, bay leaves, and peppercorns, and allow it to slowly come to a boil. Lower the heat to medium-low and gently simmer for 1 to 1 1/2 hours, partially covered, until the chicken is done. As it cooks, skim any impurities that rise to the surface; add a little more water if necessary to keep the chicken covered while simmering. Carefully remove the chicken to a cutting board. When its cool enough to handle, discard the skin and bones; hand-shred the meat into a bowl.